This cliff is an extensive field of study for the geologist, and is full of interest for the intelligent visitor. 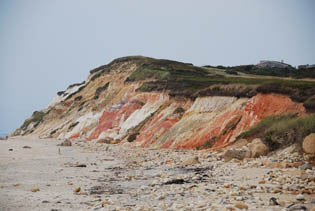 "A section across Gay Head," says Prof. Hitchcock, "four fifths of a mile long, displays twenty-three bright-colored bands of clay, sand and conglomerate, lignite and iron ore. The clays are white, blood-red, dull-red, yellow and green. The conglomerates contain fragments of bones and of teeth, cemented to the stones." Cut into innumerable forms by the incessant action of the sea, this beetling headland, belted with rainbow colors, awakens the admiration of all who approach the coast, and presents a lesson of profound significance to the scientist. The arboretum hosts a free talk by entomologist Joe Elkinton on his research into controlling winter moths (a major tree defoliator) with a species of parasitoid fly. Parasitoids are animals that feed on a living host (in this case the winter moth), eventually killing it. Learn about the Island's four native turtle species at this educational program co-hosted by.Felix Neck and the O.B. Library. For more info call (508) 693-9433 or see website. The winter market is indoors at the Ag Hall on Panhandle Rd. Twenty vendors, live music, and lunch available. In the brief season between Halloween and Thanksgiving, we turn to Ginny Jones' cookbook Fresh from the Vineyard for a recipe that could work for either. 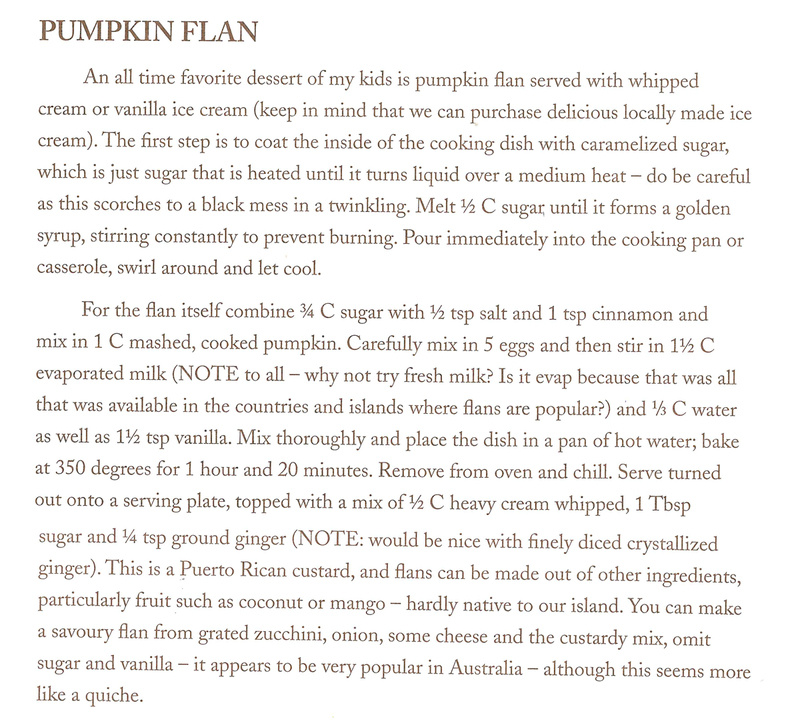 Odds are if you make anything this season with fresh pumpkin you'll have a bit leftover that won't fit in the recipe: this flan, which uses just one cup, would make for a delicious solution. Fresh from the Vineyard is available at many Island stores and farms, including Bunch of Grapes, Cronig's, Larsen's Fish Market, Allen Farm, Morning Glory Farm, Mermaid Farm, Nip N' Tuck Farm, and Fiddlehead Farm.Stand. Please join us Sunday, November 10th from 1:00 to 3:00 pm as VCS kicks off its annual program of guided winter walks with an interpretative hike to see some of the Vineyard’s most ancient geological deposits, the Gay Head Cliffs in Aquinnah. Ecologist and amateur geologist Bob Woodruff will lead the walk with VCS Executive Director Brendan O’Neill. Participants will learn about the complex geology of the cliffs and current influences like erosion and slumping. Building on the VCS climate change awareness work of recent years, the theme of this year’s walks is “Living at Sea Level.” Each month we hope to combine an exploration of issues impacting our island with an invigorating walk at (or near) sea level. Check out the complete schedule at our website: this year's itinerary presents a strong collection of old favorites (the Frances Woods Preserve), new traditions (a kids' event at Sense of Wonder Creations), and little-known Island history (the lost Bass Creek of Vineyard Haven). Parking is at the large lot below the circle at the cliffs, marked with VCS signs. Cider and cookies will be served afterward. Despite the fact that no one enjoys trash day or a trip to the town transfer station, it is at least conceivable that solid waste could become a resource rather than a burden. A described in the NY Times, a new type of trash incineration plant will soon be online in Poland, converting over 100 tons of waste daily into 7 megawatts of electricity. That waste-to-energy system is being developed by a Canadian company, which has projects already operating in several countries, including the U.S. There are actually many players in this rapidly developing tech field, and the various approaches to generating energy come with their own environmental benefits and harms. It is a complicated issue to be sure, but in most cases waste-to-energy comes out looking relatively green compared to the alternatives. For example, some methods involve a large release of CO2, a serious problem, but still preferable to the massive release of methane (a much more potent greenhouse gas) that results from conventional landfills. Could such a plan be possible here? We currently export our garbage, accepting the expense in freight hauling and greenhouse gas emissions, and import our electricity, paying higher rates, presumably due to the challenges of underwater transmission. The incineration plant in Poland described in the Times story would be a good bit too large for our uses, and it seems unlikely that the Vineyard could export electricity at a competitive price. The article does briefly mention smaller, modular waste-to-energy systems that are made to be transported in standard shipping containers. Maybe a large-scale plant is necessary to achieve an acceptable level of efficiency or return on investment, but it certainly seems worth looking into before saying it can’t happen here. After all, we already have a mobile slaughterhouse for poultry, with a larger facility for four-legged animals hopefully on the way, and both are clear improvements – for the environment, economy, and quality of (animal) life – over the old way of doing things.